Objectives: The aim of this study was to investigate the effects exerted by the acidulated fluoride gel on stainless steel and nickel-titanium (Ni-Ti) orthodontic wires. Materials and Methods: Sixty stainless steel and Ni-Ti orthodontic archwires were distributed into forty archwires used for in vitro study and twenty for in situ study. Fluoride was applied for 1 h in the in vitro experiment while it was applied for 5 min in the in situ experiment. The friction resistance of all wires with ceramic brackets before/after topical fluoride application was measured using a universal testing machine at 1 min intervals of moving wire. Moreover, surface properties of the tested wires before/after fluoride application and before/after friction test were examined by a scanning electron microscope (SEM). Dunnett's t-test was used to compare frictional resistance of as-received stainless steel wires and Ni-Ti wires to the wires treated by fluoride in vitro and in situ (P < 0.05). Two-way ANOVA was used to compare the effect of fluoride application and type of wire on friction resistance in vitro and in situ (P < 0.05). Results: Ni-Ti wires recorded significantly high friction resistance after fluoride application when compared to stainless steel wires in vitro, P < 0.05. Fluoride application did not significantly affect the friction resistance of the tested wires in situ, P < 0.05. 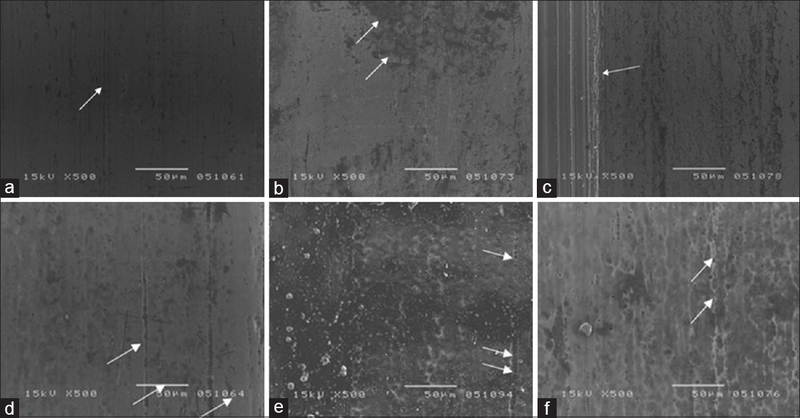 SEM observation revealed deterioration of the surface texture of the Ni-Ti wires after fluoride application in vitro and in situ. Conclusions: The in vitro fluoride application caused an increase in friction resistance of Ni-Ti wires when compared to stainless steel wires. In vitro and in situ fluoride application caused deterioration in surface properties of Ni-Ti wires. The aim of this study was to evaluate the friction resistance of nickel-titanium (Ni-Ti) and stainless steel wires to ceramic brackets before/after application of fluoride and to investigate the effect of topical fluoride application on the surface properties of Ni-Ti and stainless steel wires by scanning electron microscope (SEM). Sixty central incisor ceramic brackets standard edgewise (no built-in torque or tip) (Signature III, RMO, Inc., Denver, Colorado, USA) [Figure 1] with slots size 0.022 inch × 0.028 inch were used in this study. The summary for the groups is presented in [Figure 2]. Two different wires with a cross-section of 019 inch ×0.025 inch currently used in orthodontics were investigated: One was stainless steel alloy Tru-Chrome Resilient archwire (RMO, Inc., Denver, Colorado, USA) and the second was preformed Ni-Ti orthonol superelastic archwire (RMO, Inc., Denver, Colorado, USA). The topical fluoride agent used was APF (Nupro APF), 1.23% NaF, pH 3.9 (Dentsply International, York, PA, USA). The wires were divided into two groups having twenty specimens from each type of wire in each group. Half number of wire specimens in each group was immersed in fluoride gel for 1 h  while the remaining specimens in each group were not subjected to any fluoride treatment and acted as control. All patients were young adults with permanent dentition ranging from 12 to 18 years old. Good oral hygiene instructions were given to all patients. Ten archwires with a cross-sectional dimension 0.019 inch × 0.025 inch from each group were placed in the patients' mouths, and the fluoride gel was applied into the applicator trays. The teeth were then air dried thoroughly, and trays were inserted with head tilted slightly forward. Patients were instructed to continue light biting action for 5 min with slight chewing motion to enhance interproximal coverage. Suction was used throughout treatment. Patients were instructed to expectorate after treatment, not to eat, drink, or rinse for 30 min. The stainless steel and Ni-Ti archwires were left inside the patient mouth for 3 weeks. Then, they were collected with sterile instruments. A total of sixty ivory central incisors were embedded with an acrylic resin block in a metallic mold where the self-cure acrylic resin was mixed and poured into the metal ring and then the teeth were embedded . Sixty ceramic brackets were bonded on the labial surface of the ivory teeth using a bracket positioner. The universal testing machine (Instron Corporation, Canten Industries, Inc., St. Petersburg, Florida, USA) was used for measuring the generated frictional force at the bracket-wire interface by sliding the wire through the bracket slot under small tangential displacements. The metallic mold was fixed firmly on the universal testing machine [Figure 1]. Then, posterior sections of each wire 4 cm long were inserted into the bracket slot. All tested wire segments and brackets were cleaned with isopropyl alcohol before testing to remove any residue or debris. Elastomeric ligatures (American Orthodontics, Sheboygan, WI, USA) were placed over the bracket tie wings engaging the archwire. One end of the tested wire was left free, and the other end was attached firmly to the moving upper arm of the universal testing machine with 5 kg load cell. The tested wire was pulled upward through the bracket slot at a speed of 5 mm/min for 1 min. , Care was taken to avoid introducing torsion into the tested wire during clamping. The reading was set to give a zero reading after the wire was lightly tightened and was completely in a straight, vertical position toward the moving arm (upper fixture). This ensured that the only force transmitted by the moving arm to the wire and through the tested wires to the brackets was recorded as frictional force only. The frictional force generated by each wire-bracket assembly was registered in kilograms by the tension load cell. After each test, the mold was removed and a new specimen was placed with a new ceramic bracket. New wire specimen was fitted into the bracket's slot. Then, the mold was fixed firmly on the testing machine, and the process was repeated for different archwire specimens. The load cell was calibrated before each measuring session. It recorded the static frictional force while the wire was drawn the same distance through different bracket-archwire assembly. Static frictional force was measured as the value of force needed to start the wire movement through the bracket slot. This force was measured as the maximal initial moving force on the universal testing machine digital display at 1 min intervals of moving wire. All specimens were examined before and after the friction test by an SEM (Jeol JSM-225-11-Scanning Microscope, Jeol Ltd., Tokyo, Japan) to determine the surface changes on the orthodontic wire after the friction test and the application of fluoride. The wire specimens were mounted on copper stubs using silver glue, and then specimens were placed with standardized angle of tilt in the SEM, and photomicrographs were taken at a low magnification of ×150 and a higher magnification of ×500. The results were recorded and analyzed statistically using Dunnett's t-test to compare the frictional resistance means of the in vitro and in vivo experiments of the different wires used in this study to the control as-received specimens. Two-way ANOVA and Tukey test were used to compare the effect of the wire type and fluoride application on the frictional resistance of wires used in this study. All statistical examinations were carried out at a level of significance of P < 0.05. Results revealed that the degree of friction generated at the bracket/archwire interface was affected by the type of archwire. The mean and standard deviation of frictional resistance of the two archwires are summarized in [Figure 3]. Figure 3: The frictional resistance values of the tested wires to ceramic brackets in kg. Values are presented as mean ± standard deviation. Significant differences between the groups are marked with asterisks ( P ≤ 0.05). 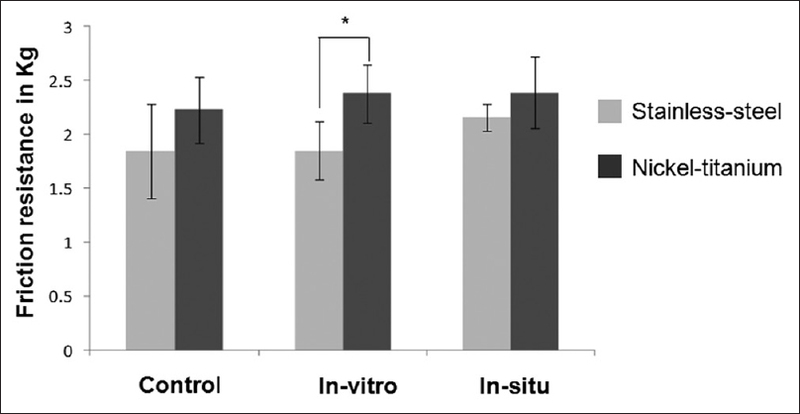 Paired t-test showed that there were no significant differences between the frictional resistance means of all wires' in vitro and in situ specimens when compared to their control specimens [Figure 3]. 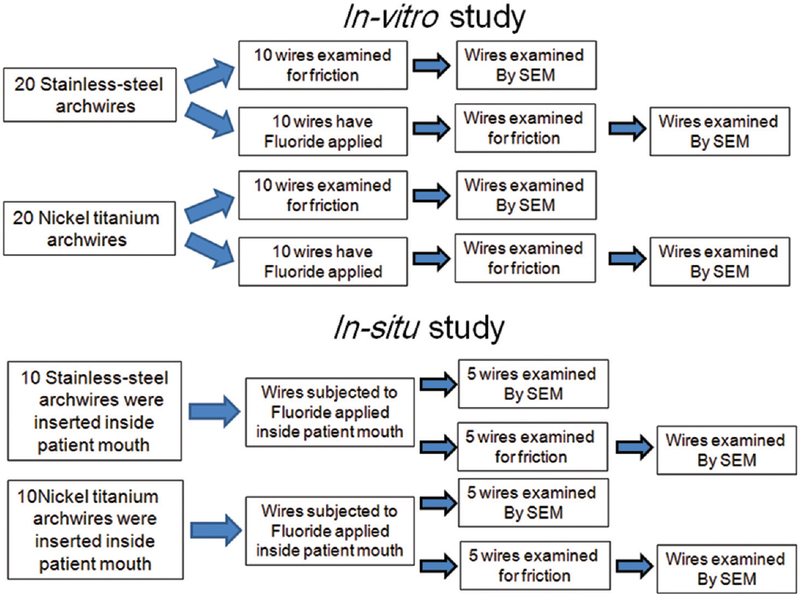 Two-way ANOVA and Tukey test showed that there was no significant difference between Ni-Ti wires when compared to stainless steel wires treated with fluoride in situ; however, the in vitro application of fluoride recorded high friction resistance between ceramic brackets and Ni-Ti wires when compared to stainless steel wires, P < 0.05. The observed surfaces of the as-received stainless steel wires showed that it exhibited a smooth surface before friction test [Figure 4]a. After friction test, fine tracks were observed [Figure 5]a. The as-received Ni-Ti side surface showed areas of longitudinal cracks and pits [Figure 4]d. After the friction test, areas of longitudinal cracks and pits were observed on the Ni-Ti wire surface along with deep line of draw for the wire through ceramic bracket resulting from the friction test [Figure 5]d.
The in vitro application of fluoride exerted detrimental effects on the Ni-Ti wires with evident signs of surface corrosion either before or after friction test. Before the friction test, fluoride attacked the Ni-Ti surface causing masses of corrosive products and surface cracks [Figure 4]e. After the friction test [Figure 5]e, major cracks were observed. However, the stainless steel wires showed less signs of surface deterioration either before or after the friction test [Figure 4]b and [Figure 5]b. The application of fluoride in the in situ experiment confirmed that the results obtained from the in vitro experiment as less surface changes were observed on the surface of the stainless steel wires [Figure 4]c and [Figure 5]c when compared to Ni-Ti wire specimens tested in situ [Figure 4]f and [Figure 5]f.
The selected duration of fluoride application in the in situ study was according to the manufacturer's instructions. However, the adopted duration in the in vitro study was 60 min which corresponds to 21 days of daily tooth brushing (equivalent to average follow-up period during orthodontic treatment). The obtained results of the current experiment showed that fluoride caused deterioration of the Ni-Ti wires' surface texture and a concomitant increase in its friction resistance to ceramic brackets which was clearly evident from the in vitro experiment obtained results, which may be attributed to the fact that the corrosion behavior of the titanium containing alloys depend on an oxide film composed of mainly titanium oxide on the surface, ,, which spontaneously covers the surface of titanium and its alloys in the presence of oxygen. This oxide film undergoes a reaction in fluoride solutions, resulting in the formation of titanium fluoride, titanium oxide fluoride, or sodium titanium fluoride on the surface of the alloys. Hence, the corrosion resistance of those alloys decreases markedly in these solutions. , The destruction of the oxide layer may lead to the absorption of hydrogen from various solutions because of the high affinity of titanium to hydrogen, which is known as hydrogen embrittlement. There should be great care when interpreting the obtained results of the current experiment to the clinical situation because orthodontic wires are usually exposed to fatigue stresses during orthodontic tooth movement making them more liable to corrosion. Moreover, continuous contact of the Ni-Ti wires to various consistencies and pH of different food substances may cause various chemical changes that may enhance corrosion of these wires. Further research is needed to investigate the exact biological effect of the released ions from the corrosion process of the titanium-containing wires on the oral environment in vivo. This study showed the liability of Ni-Ti wires to corrosion when exposed to high concentration of fluoride containing agents. The as-received Ni-Ti wires showed roughness of their surfaces and significantly increased friction to ceramic brackets when compared to stainless steel wires. Moreover, application of topical fluoride caused deterioration of surface properties of Ni-Ti wires. Therefore, it is highly recommended to take into consideration the content of the oral health care products utilized by the patients when recommending these agents to orthodontic patients treated by Ni-Ti wires. Loftus BP, Artun J, Nicholls JI, Alonzo TA, Stoner JA. Evaluation of friction during sliding tooth movement in various bracket-arch wire combinations. Am J Orthod Dentofacial Orthop 1999;116:336-45. Bishara SE, Olsen ME, VonWald L, Jakobsen JR. Comparison of the debonding characteristics of two innovative ceramic bracket designs. Am J Orthod Dentofacial Orthop 1999;116:86-92. Fidalgo TK, Pithon MM, Maciel JV, Bolognese AM. Friction between different wire bracket combinations in artificial saliva - An in vitro evaluation. J Appl Oral Sci 2011;19:57-62. Guerrero AP, Guariza Filho O, Tanaka O, Camargo ES, Vieira S. Evaluation of frictional forces between ceramic brackets and archwires of different alloys compared with metal brackets. Braz Oral Res 2010;24:40-5. Nishio C, da Motta AF, Elias CN, Mucha JN. In vitro evaluation of frictional forces between archwires and ceramic brackets. Am J Orthod Dentofacial Orthop 2004;125:56-64. Doshi UH, Bhad-Patil WA. Static frictional force and surface roughness of various bracket and wire combinations. Am J Orthod Dentofacial Orthop 2011;139:74-9. Tanne K, Matsubara S, Hotei Y, Sakuda M, Yoshida M. Frictional forces and surface topography of a new ceramic bracket. Am J Orthod Dentofacial Orthop 1994;106:273-8. Watanabe I, Watanabe E. Surface changes induced by fluoride prophylactic agents on titanium-based orthodontic wires. Am J Orthod Dentofacial Orthop 2003;123:653-6. Schiff N, Grosgogeat B, Lissac M, Dalard F. Influence of fluoridated mouthwashes on corrosion resistance of orthodontics wires. Biomaterials 2004;25:4535-42. Ogawa T, Yokoyama K, Asaoka K, Sakai J. Hydrogen absorption behavior of beta titanium alloy in acid fluoride solutions. Biomaterials 2004;25:2419-25. Al-Khatib S, Berradja A, Celis JP, Willems G. In vitro friction of stainless steel arch wire-bracket combinations in air and different aqueous solutions. Orthod Craniofac Res 2005;8:96-105. Prososki RR, Bagby MD, Erickson LC. Static frictional force and surface roughness of nickel-titanium arch wires. Am J Orthod Dentofacial Orthop 1991;100:341-8. Tecco S, Tetè S, Festa F. Friction between archwires of different sizes, cross-section and alloy and brackets ligated with low-friction or conventional ligatures. Angle Orthod 2009;79:111-6. Matono Y, Nakagawa M, Matsuya S, Ishikawa K, Terada Y. Corrosion behavior of pure titanium and titanium alloys in various concentrations of acidulated phosphate fluoride (APF) solutions. Dent Mater J 2006;25:104-12. Garner LD, Allai WW, Moore BK. 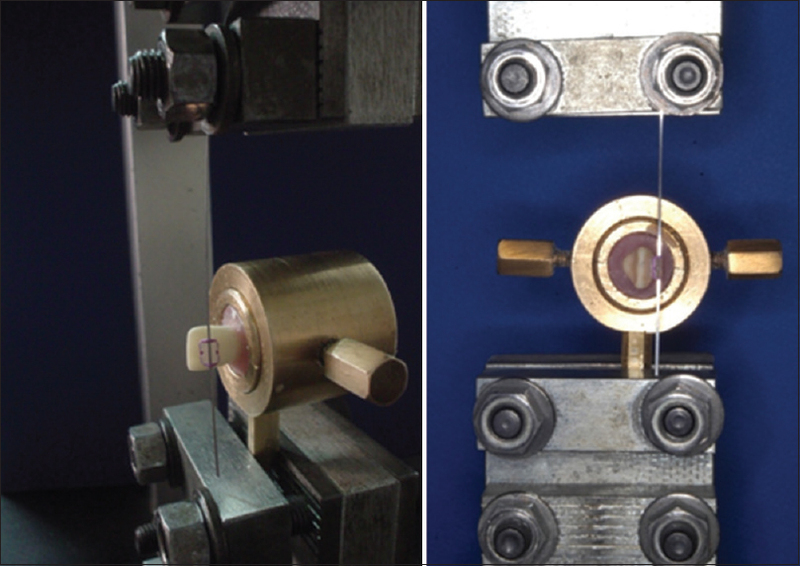 A comparison of frictional forces during simulated canine retraction of a continuous edgewise arch wire. Am J Orthod Dentofacial Orthop 1986;90:199-203. Kwon YH, Jang CM, Jang JH, Park JH, Kim TH, Kim HI. Effect of fluoride released from fluoride-containing dental restoratives on NiTi orthodontic wires. Dent Mater J 2008;27:133-8. Burrow SJ. Friction and resistance to sliding in orthodontics: A critical review. Am J Orthod Dentofacial Orthop 2009;135:442-7. Krishnan V, Kumar KJ. Mechanical properties and surface characteristics of three archwire alloys. Angle Orthod 2004;74:825-31. Cordasco G, Farronato G, Festa F, Nucera R, Parazzoli E, Grossi GB. In vitro evaluation of the frictional forces between brackets and archwire with three passive self-ligating brackets. Eur J Orthod 2009;31:643-6. Yokoyama K, Kaneko K, Moriyama K, Asaoka K, Sakai J, Nagumo M. Hydrogen embrittlement of Ni-Ti superelastic alloy in fluoride solution. J Biomed Mater Res A 2003;65:182-7. Huang HH. Variation in surface topography of different NiTi orthodontic archwires in various commercial fluoride-containing environments. Dent Mater 2007;23:24-33. Huang HH. Corrosion resistance of stressed NiTi and stainless steel orthodontic wires in acid artificial saliva. J Biomed Mater Res A 2003;66:829-39. Angolkar PV, Kapila S, Duncanson MG Jr., Nanda RS. Evaluation of friction between ceramic brackets and orthodontic wires of four alloys. Am J Orthod Dentofacial Orthop 1990;98:499-506. Eliades T, Eliades G, Athanasiou AE, Bradley TG. Surface characterization of retrieved NiTi orthodontic archwires. Eur J Orthod 2000;22:317-26. Wichelhaus A, Geserick M, Hibst R, Sander FG. The effect of surface treatment and clinical use on friction in NiTi orthodontic wires. Dent Mater 2005;21:938-45. Strietzel R, Hösch A, Kalbfleisch H, Buch D. In vitro corrosion of titanium. Biomaterials 1998;19:1495-9. Cacciafesta V, Sfondrini MF, Ricciardi A, Scribante A, Klersy C, Auricchio F. Evaluation of friction of stainless steel and esthetic self-ligating brackets in various bracket-archwire combinations. Am J Orthod Dentofacial Orthop 2003;124:395-402. Eliades T, Bourauel C. Intraoral aging of orthodontic materials: The picture we miss and its clinical relevance. Am J Orthod Dentofacial Orthop 2005;127:403-12.